Here is the mandatory buddy of ProjectX, that you can use to rebuild video from separated streams (audio, video). Cuttermaran can open a video file separated from its audio part (M2V format), add some audio tracks to it (MP2, AC-3...), reorder them, and most of all, keep only parts of them; very useful when it comes to delete ads and other useless and boring parts of a movie recorded from broadcast TV. Just like ProjectX, Cuttermaran can merge all parts without additional video compression, but doesn't handle HD video either. However, unlike ProjectX, its interface is quite clear and well-designed, but it only works on Windows with the Microsoft .NET framework. When you record movies from digital TV networks (like DVB-T), they often come with artefacts due to a loss of antenna reception, sometimes responsible for bad video playback after recording. ProjectX can fix all errors due to these artefacts. To do so, it splits an MPEG-2 video (standard definition DVB data) in several streams (video, audio, subtitles...) and outputs a report of all errors it detects in the video (indicating when artefacts occured). On the output video, parts leading to read errors are being cut; ProjectX is not a tool to recover missing parts, which are definitely lost while recording. But it can also fix audio and video synchronization errors due to these artefacts. All operations are done without any video encode process, leading to lossless quality. Unfortunately, it doesn't handle HD video streams (MPEG-4, QuickTime, H.264...) and its strange GUI is very disturbing. But it is probably one of the most efficient among all free software, even on heavily damaged videos, moreover being a multiplatform tool (Windows, Mac OS, Linux...). ProjectX and Cuttermaran are excellent tools to fix and cut videos from digital TV broadcasting. However, they lack HD video support. As an alternative, you can use Smart Cutter. Just like the above-mentioned software, it can delete all unwanted parts of a video file, being either standard definition (MPEG-2) or high définition (MPEG-4), with frame-accurate precision. Cutting is also done without any video reencoding process for lossless quality. It has also some tiny video fixing capabilities, although less efficient than ProjectX, rather unstable with heavily damaged videos. The unregistered version of Smart Cutter adds a FAME logo watermark on any output video, but that's the only trial limitation. When you record videos from digital TV broadcasting, the recording may suffer from artefacts because of antenna reception loss. To overcome this issue, you can choose to record the same program several times and keep the best recording. PTvM TS TsMerger avoids this hassle by merging two recordings made from the same channel at the same time, in a single video, keeping only the best bits of both. Designed by Pouchin TV Mod's author, this very efficient tool can thus make an often perfect video from variable quality files, given that both don't suffer from the same artefacts at the exact same time. It can work with both SD and HD streams, and is able to detect the beginning and the end of each file to layer them perfectly. Very handy when you have to stop a recording on a TV tuner to resume it on another appliance, and obtain a perfect merge of both recordings. Another tool to split video files, just like ProjectX, Cuttermaran and Smart Cutter. However, this one doesn't rely on frame-accurate cut process like these ones, but splits video files according to a given size, number of parts or target support (CD, DVD...), without taking care of video encoding format, being either HD or SD streams. Concretely, it's an usual splitter and joiner software, but best-suited for Transport Stream TS video files. 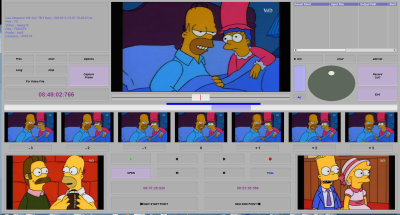 Thanks to this "raw" cut process, TSSplitter does not suffer from damaged recordings and can work on many formats, but can't display any integrated preview of the source video, and doesn't prevent making unreadable video output files. You'll have to use it when splitting using another tool doesn't produce useable files.